Members of the TGF-β superfamily play pleiotropic activities in the thymus, which ultimately involve epithelial cell homeostasis and proper maturation of many T cell subsets. 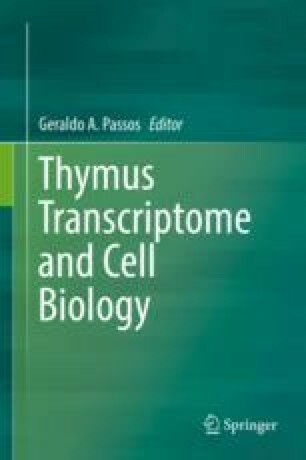 This chapter performs a second-level analysis of thymic transcriptomes to highlight key factors and functional evidence that may be used to guide putative medical interventions for rescuing the production of a given specific T cell type. This work benefited from data assembled by the ImmGen consortium. A.D.J. is supported by a fellowship from the Rio de Janeiro State Research Council/FAPERJ (E-26/202.683/2016). The work was financially supported by the Oswaldo Cruz Institute/Fiocruz, the Estacio de Sá University (Productivity in Research Program), the Brazilian National Institute of Science and Technology on Neuroimmunomodulation/INCT-NIM, MERCOSUL Fund for Structural Convergence/FOCEM, the Brazilian Research Council/CNPq, and the Rio de Janeiro State Research Council (FAPERJ).